Sometimes things are just better left alone. 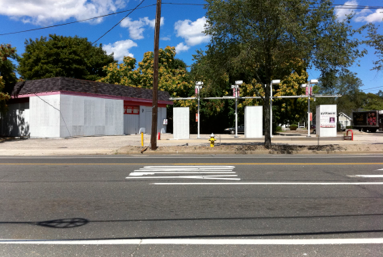 No Coke machines, not even the pumps that sold the gas. Forget the Taco Bell remodel. Black is the easiest to keep the graffiti covered, required by law in Jersey, owners discretion as to how. Post no “bills”. Henry Ford once said “I don’t know much about history, and I wouldn’t give a nickel for all the history in the world. History is more or less bunk. We don't want tradition. We want to live in the present and the only history that is worth a tinker's damn is the history we make today”. I don’t know Henry, I kindalike these new ready-made’s. Thanks Hank. Today we have the opportunity to re-invent the way we make buildings. Buildings consume 40% of our country’s energy, 22% of that total is from residential consumption. Energy companies have us in the palms of their hands. It’s your choice to keep paying them! Sheridan Green is a self-sustaining residence. The house will achieve a Tier 3 Energy Star Rating while reaping all state & federal tax breaks and incentives. It creates it’s own energy by using both active & passiveheating and cooling strategies. It collects and reuses all of it’s rain water. Vegetative roofs are used to cool the house and provide sustenance. The combination of these ideas is a version of MODERN-HOMESTEADING. Your property, your energy, your choice! The house is located on a gravel road, close to the Peconic Bay in Long Island. The wooded 1.1 acre lot falls 20 feet in height from the front to rear. 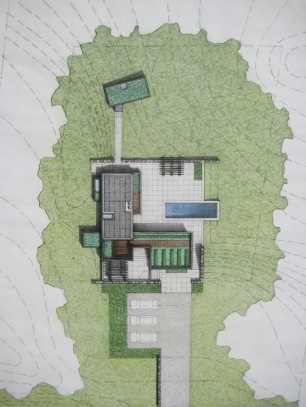 The building is set into the hill, creating an upper Entry Level for the House and Studio, and a lower Courtyard Level which all the Living spaces surround. The house is 2,000 sq.ft. MICRO-PLANTING: This is a solution where each building can create enough of it’s own energy to exist independent of the power grid. This house uses a combined system of an open-well geo-thermal radiant floor heating/forced air cooling system with a 7 kilowatt PV array providing all the electric to run the geo-thermal heat pumps and the entire electrical needs of the house. Millions of smaller energy saving solutions can have a greater affect than singular larger ones! Energy companies will tell you otherwise BUT, your house & property can be it’s own power plant, farm and most importantly, your independence! Join the revolution! Foundation - poured concrete with exterior set board insulation for earth damming cooling effects. Insulation -open cell foam R-25 ext. walls, R-38 ext ceilings/attic, R-10 foundation walls/slab. Roofing - white EPDM membrane w/ sedum plantings. Floors - radiant heated poured concrete at lower level, radiant “warm-board” ply at upper level. Siding/Trim/Trellis - natural finish vertical t&g rough sawn western red cedar. Windows/Doors - high performance Low E, double pane insulated panels. Lighting - LED, fluorescent, natural daylighting. Originally renovated in the 70’s, the Penthouse Suite required a complete restoration. Thru the Landmark Preservation Commision, we were able to replace all the exterior doors, windows and skylights as per original mullion & mutton specifications. New concealed duct air conditioning units were installed with all required electric & lighting upgrades. To simplify the interior, all new window boxes with heater covers were fashioned to give the rooms a more continuous feel. Natural daylighting from the skylights creates a central focus point the around the fireplace. 24 carrot yellow and white gold mosaic tiles shimmer on the surface with a new custom fabricated stainless steel fireplace enclosure. The furniture is composed of a classically modern, yet relaxed pieces that are arranged in the apartments open spaces. A complete Kitchen remodel was also performed. The wrap around exterior Terrace provides sweeping views of Manhattan. 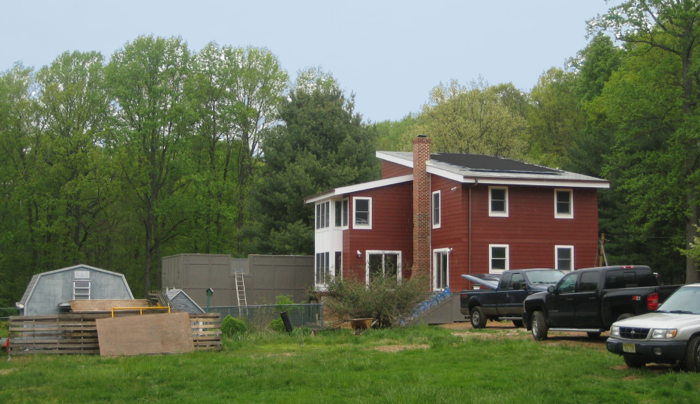 An Energy Star Rated Home: Achieving Net Zero! As an Architect, I feel it is my obligation to design buildings that are not only beautiful and meet my Client’s needs & expectations, but are ALSO good stewards of the earth, energy and utility. The great Swiss Architect, LeCorbusier, proclaimed in 1923 that “the house is a machine for living”. A visionary statement that is more relevant than ever in our contemporary environment. The operation of Buildings consume 40% of the world’s energy. Housing in the United States is a massive component in this statistic. How many of us growing up even considered this topic would carry so much weight in today’s world. Yet, as households across our country find that month to month energy costs continue to rise and pay their checks do not. Energy bills are choking families everywhere. That fact is, the cost of fossil fuels are not coming down any time soon and no matter what the Energy Company’s proclaim as the next “Silver Bullet”, these are 50 year solutions at best. We can’t count on top down solutions any longer! Design can make a difference! It is my belief that millions of small solutions can have a greater impact than singular larger ones. This is the main idea behind the ENERGY STAR program developed and operated by the EPA and certain States who chose to take part. The fundamental goal of the program is put forth a series of guidelines that provide a framework for Architects, Builders and Home Owners to design and develop more energy efficient, sustainable buildings. Since it’s inception in 1982, It has had a significant impact in reducing our country’s energy use, carbon footprint and is responsible for thousands of products used by people around the world. Sheridan Green is a residence in Hampton Bays, New York that will be an Energy Star qualified home, achieving at a minimum, a Tier 3 (out of 4) rating from the program. The primary energy index used to measure the energy efficiency of a building is the HERS index (Home Energy Rating System). The system works as follows: 0 = best (net zero energy consumption to energy generation ratio), 100 = worst. A HERS rating of 70 is the minimum rating in which a building can be considered eligible for the program. Sheridan Green has a preliminary HERS rating of 6. We are going for 0! Buildings can generate and use energy in numerous ways known as ACTIVE and PASSIVE design strategies. 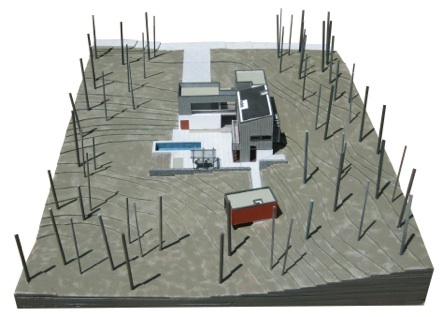 An ACTIVE design strategy would be a solar photovoltaic array that creates electric and is used by the structure itself. A PASSIVE strategy would be the winter sun, penetrating deep into the house and providing free heat by warming the interior space. Good design uses these principals as part of its palette. The following outlines how this project, Sheridan Green approaches these topics, as well as sustainable design practices at all levels of construction and presents a template for considering the design for any house or building. These ideas together represent a new attitude towards making houses. MODERN-HOMESTEADING. Your property, your energy, your choice! 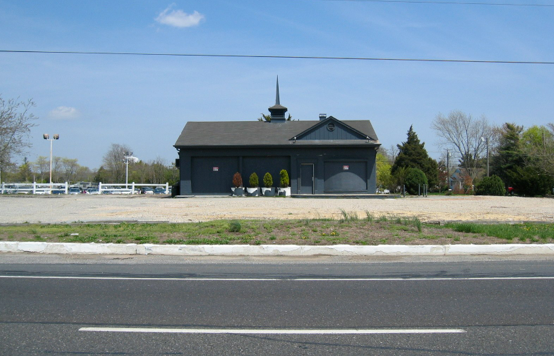 The property is a 1.1 acre parcel that sits over the Suffolk County Aquifer District that mandates a maximum of 50% allowable removal of any native vegetation. Also, all rainwater must be managed on site thru dry-wells and natural means. 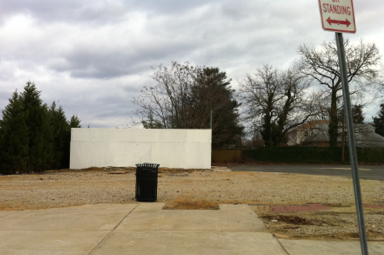 We removed 40% of the existing vegetation. Every Oak tree has been stacked and is reserved to be burned in the House’s fireplace, while all the remaining pine trees and brush were chipped on-site and used as ground cover during construction. Rainwater is collected and used in series of ways for this project. The first consideration is the “positioning” of the house itself. The property falls 20 feet from front to back. The house is set INTO the hill and creates an upper ENTRY level and a lower COURTYARD level. This positioning of the building requires little need for the regrading of the property, using the existing topography to it’s benefit. The roofs all serve the building in a series of ways. Any of the “flat” surfaces are covered in a 90 mil. EPDM membrane roofing and will be covered with living sedum plantings and a roof garden that will be placed over the Carport away from the prolific amount deer. These vegetative surfaces minimize any runoff by absorbing the water themselves. The rainwater that drains from the angled roof, covered with a 7 KW solar photovoltaic array, will be collected into containers at the roof garden level and used to water the garden as needed. Any additional runoff will be placed into underground dry-wells. Green area to be cleared. Chipped pine trees, stacked oaks. It is my belief as an Architect that every building has two Clients, the OCCUPANTS and the SITE itself. The “fixing” of the structure to the site’s context is the dynamic element that gives any structure it’s resonance. If this is done well, the foundation becomes an artifact. It tells the story all by itself. Earth Damning: This is a passive design strategy where by placing the rigid insulation board on the exterior of the foundation, you keep any moisture from penetrating the wall while maximizing the cooling effects provided by the concrete itself being “rooted” in the earth and transferring the free cool energy vertically during the warm months. We used 2” rigid insulation board to achieve an R-10 insulation value. 8” poured concrete walls were used for the house and 10” for the retaining walls. All the interior walls of the lower living will be exposed and left natural. The budget for this project is not negotiable. Structural efficiency is key. Finding the balance between pragmatic framing solutions and providing moments of curiosity within the capacity of a material is the fun part of designing a house. At 1,966 square feet of heated area, it’s not large house BUT it’s form can suggest otherwise. Sculpting the interior and exterior spaces give the project a much grander feel then the actual size suggests. Glu-laminated beams are used for all major spans, TJI’s for all floor plates. 2 x 6 exterior walls, 2 x 4 interior walls. The sheathing used is a product known as ZIP-SYSTEM. It is a 1/2” thk. OSB material that has an exterior coating which eliminates the need for typical exterior building paper or Tyvek. The green coating is impregnated into the exterior surface and keeps moisture entering from the exterior while allowing the interior to breath. Secondly, a black adhesive tape is applied to all the exterior seams for a tight building envelope. This will be used with an open cell spray foam insulation on the interior that will be addressed in a future blog post. An important issue to keep mind is as follows: since the this provides an extremely tight building envelope, the HVAC system has to incorporate a pressure balancing system that combines an interior and exterior air exchange. Otherwise the possibility negative air pressure issue when the system is in use can be an issue. 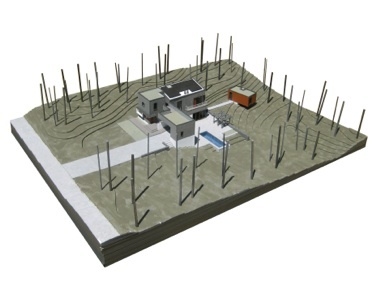 The HVAC system for the house will primary be a geo-thermal, vertical closed loop, forced-air system. This will also be addressed in a future blog. At the lower living level will be an exposed concrete slab. To heat this slab, a hydronic radiant heating system will be placed, run by a de-superheater off of the geo-thermal heat exchangers to an 80 gallon reserve hot water heater, the electricity provided by the solar array. The actual radiant system is a product called CRETE-HEAT. This product is a 3 in 1 solution. The 2.5 thk. x 2’ x 4’ T&G panels provide an R-10 insulation value, vapor barrier and snap-in system for the PEC’s tubing. A 4” thk. concrete slab is poured over the system with expansion joints at the perimeter and sawn control joints to reduce cracking. Ultimately this slab will be stained and polished and left exposed for a warm surface. The existing cottage and pool can’t keep up. These people like to entertain! Looking to expand their living environment, this couple has been considering how to use the property’s “park like” setting for some time. The 3/4 acre site contains many perennial gardens and specimen trees that have been propagated for many years. The program was to expand a new ground floor living space off the existing cottage and create a formal entry courtyard with garage on the more public, eastern side of the property. The new ground level living & dining rooms open directly onto the pool patio. A new entry opens to the courtyard. The main bedroom is placed on the 2nd floor, overlooking the pool and opens to an adjacent deck. An additional bedroom and studio are placed over the garage. The existing 600 sq.ft. cottage, built in 1950’s, was once a nursery that serviced the adjacent road which connects the town to the local bay and ocean. The property is spotted with mature trees and overlooks a open lawn surrounded by a continuos hedgerow. The clients desired the residence to be an energy-efficient design and composed of sustainable, long-lasting, low-maintenance materials. The energy system will be a geo-thermal radiant slab floor system powered by a 6kw electric solar array on the new south facing roof. Solar hot-water panels will also be utilized. The exterior siding and trim will be natural red cedar shakes and boards. Open cell soy-based spray foam insulation will provide a tight and efficient building envelope in both the old and new portions of the house. A family of 6 has decided to leave behind their 7,000 sq.ft. residence with outrageous energy bills for a more sustainable and simple lifestyle. Having no preconceptions towards the existing house and property, the new design aims to re-invent the formal entry to the property and composition of the house. The existing 1,100 sq.ft. residence, built in 1953, sits on 4 acres of land. The property is covered with specimen trees and overlooks a rolling lawn that falls into the forest below. The clients desired the new residence to be an energy-efficient design and composed of sustainable, long-lasting, low-maintenance materials. The energy system will be a geo-thermal forced air system powered by a 6kw electric solar array on the new south facing roof. Solar hot-water panels will also be utilized. Closed cell soy-based spray foam insulation will provide a tight and efficient building envelope in both the old and new portions of the house. The new driveway will be placed on the north side of the property leading to a new entry courtyard placed between the new addition and existing garage. 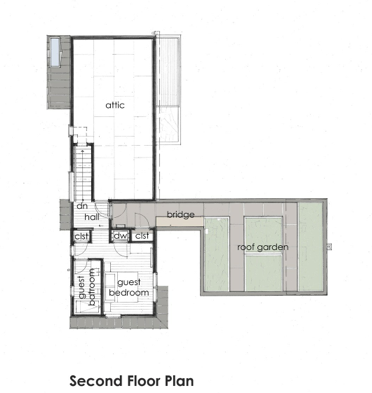 The first floor of the house will expand the common living areas and be connected to a new roof garden and trellis over the existing garage. A 2nd floor will be added to the house and contain all the bedroom/bathroom spaces. The master suite will face the lawn and overlook the forrest and sunsets. Completion set for July 2012. Radiant floor tubing in basement. View from south west with solar electric and hot water panels.